Purchased five of these and let them charge for a day, in the evening they came on and they look great! Flame flickers and does look like they the real thing. Even last through the night until dawn. Very pleased. Excellent Product. They look totally authentic to the point that if you go to move one when they are on you expect it to be hot ðŸ˜. With low sun during the day they have stayed in all night. The eco mode is still really bright and the solar panels are well sealed and excellent quality. The torch has a famous light, looking like a real one. Very, very nice. I ordered 6 True Flame torches in Feb to give to family members for their respective birthdays. The last one, given in September, unfortunately did not work but my brother did not admit this until November! I contacted customer services and Luke, after advising how best to check that it was indeed faulty, immediately sent out a replacement which I received the following day. What an amazing company. 5 star service every time. Excellent product. Really good colour flickering light. We now have four. On the medium setting in summer they are still glowing away merrily at gone 4 a.m. This is the 3rd item I've purchased from the SolarCentre, and like the others it's excellent. The quality is really good, it performs really well, and looks really good. We use it when caravanning and it looks great from across the field when we come back at night! Have not put them outside to fully charge yet but turned them on to check all ok upon delivery. Unbelievably realistic, I am really impressed. Dont be put off by some comments as you may think they are poor quality when they are quite robust. I have many different lights from this wonderful company but these are my new favourites. I dont know how they work but the effect is like nothing else on the market. I didn't what to turn them off in the house! Love them. Really pleased with the lights - they look amazing. I can't believe how realistic they look. It makes me want to stay awake and watch them. Bought one of these and had a problem with the torch working. However the customer service I received was excellent and exchange was no problem. The new torch worked perfectly and looks stunning in my garden. Everyone loves it and I cant recommend the product highly enough. I love it so much I am aiming to buy some as Christmas gifts :-) Thank you Solar centre for a super addition to my garden and for your excellent customer service especially to Mr Luke Sanders . Purchased this light out of curiosity, It immediately brings an interesting and pleasing addition to the garden. Highly recommend this light and will be purchasing additional lights myself. Bought one to match another that was a gift - both work fine and make a nice glow on the patio. My wife is transfixed with these stunningly realistic flame effect lights!..We have sited 2 either side of the entrance to our logcabin.Perfect! (batteries completely flat on arrival however charged over 3 days chasing the sun prior to switching on..hold switch for 3 seconds..sorted)..quality product..recommended. These lights truly are flame like and make a stunning addition to any path/border. One thing to look out for though, it's not a simple press once for on etc. it's a press and hold for 2-3 seconds for on, thought all were faulty to start with. Still working at 6 a.m. the following morning after a couple of dull days. These torches are amazing, so realistic you'd never know they weren't real flames. Do read the instructions properly as to how to turn them on!! Another superb product from the best Solar lighting company around. I have over the years had numerous products from this company and never been disappointed, customer care is superb. We bought one of these in May last year, and were very pleased with it. On ordering, I'd suspected that it might be horribly tacky (given the usual quality of solar moving flames), but it actually looks very good indeed. Shame on me for doubting! We were so happy with it that we ordered two more in July, and were initially equally chuffed. They give off a lovely warm light, and the flickering is realistic - so much so that my mother panicked when she saw them for the first time, thinking that we had a burning bush in the garden. After but a few weeks, however, one of them stopped working (except *very* sporadically - possibly three or four times until now). We're not sure whether it's from the first or second order, but either way, it's rather disappointing. The other two continue to do their thing so wonderfully that I'm about to order one or two more, so fingers crossed we don't find another rogue light. Since receiving this product a week ago, I have ordered a further two. I think this testimony to an excellent product that delivers as promised. No hesitation in recommending it. Great product, very 'life like' good service too. Will probably buy from the Solar Centre again. Highly recommend. I bought this as a gift (and really want one for myself too!) so canâ€™t comment on its performance. However, ordering with the Solar Centre was brilliant-such a good choice and kept informed through every stage of delivery. The lamp arrived earlier than expected so very pleased with the whole experience. Will definitely use again. I have recently purchased four of these torches and find the absolutely stunning and as they say " it does exactly as it says on the box". I have now reordered another four . They really look authentic and take me back to Mauritius and the torch lighting ceremonies at dusk. I've bought many different solar lights over the years but the True Flame Torch Lights are the best by far. Great quality, very realistic flame and stay on for several hours. Will definitely be buying more. Brilliant lights so pleased with them they are much admired by our neighbours. Delivery and well packed was excellent. Thank you would recommend the Solar Centre. This is a robust and attractive light that looks stunning in the garden. At night time it really comes to life and brings the garden alive.. it isnâ€™t cheap but itâ€™s quality and thatâ€™s what you pay for. I bought 5 of them and I couldnâ€™t be happier. A real gem. Really pleased - totally different from usual Solar lights and looks good n the garden but I thought a bit expensive just for one ! These lights look fantastic. Very realistic flame effect and look great in the garden. Even on a dull day the flames last for a few hours in to the darkness. I originally bought three of them but have since purchased a further seven for friends and for Christmas presents. I highly recommend them. Bought four of these, and they look so good in the dark. This time of year, they come on just after 9.30. and are still on at 1.30 in the morning. They are very different to your normal solar lights. Will probably get some more. Delivery was excellent as well. Love it! purchased this for my garden which is going through a major re-do - and all I can say is this light is a key feature - looks amazing and the glowing light is just beautiful at night!! Would recommend this product, and yes, agree with what other reviewers have said about the plastic - but to be honest the effect of the flame effect is so nice - you do not even realise it is plastic! Wish I had purchased 2 at the time to save Â£10.......... Would enhance any garden........... Rose in Enfield. Very elegant light. Really pleased with purchase. Looks great in my garden. Think the more you buy the discount should be better . Very reliable and bright, stayed lit very long too. More reliable than the older version. Very pleased with this purchase, closest thing to a real flame i've seen. Highly recommend, you won't be disappointed. From a little way away you could be fooled into thinking this is a real flame - warm dark orange strong flickering light. Fantastic product; I love the fact that these can also be charged via usb, they are very bright but also have different light intensity modes. I purchased two and am extremely pleased that I did. I can definitely recommend. Purchased three of these last summer and found them absolutely fascinating to watch in the dark I just had to order another two. Delivery now been received! Name of product is accurate. I have one in my garden right now - I just logged in to buy more. It has worked all through the winter - even covered in snow!! I couldn't believe it. My friends and neighbours are fascinated by it. Need more!! Absolutely stunning lights, love them they look lovely in the evening lit up will be ordering more!!!! I have brought from this company before,excellent service great lights. Will be buying from them again. Fabulous. Bought 2. And placed in raised trough container. Decent size and great display. Having ordered solar lights from the solar centre before, I was not disappointed by these. They look great and work well and will suit my needs in the garden. Well done Solar Centre. Love the lights and TrueFlame effect. Really helpful company, would happily buy from them again. These latest flickering flame lights are the best yet and at a very reasonable price. The easy charging facility has increased their desirability and performance. I now have a total of three new ones. Arrived on time and work well. Look fabulous and run almost through the night even with winter sun only. Very warm light and the flickering is hypnotic and delightful. Very impressed with these lights, as they really do look like real flames. Attractive design so they even look good in the day time. Make sure you read the instructions as to turning them on as we initially thought they were faulty as you have to press the button for 3 seconds.to turn them on. I now have 6 of these lamps . They look great would highly recommend . Will probably buy more. I already have 4 of theses and just bought 2 more to give as Christmas presents. I should wrap them up now or they may end up in my garden!! !They really do look like real flames and keep going for at least 8/ 10 hours each night. good value for money . Have bought many various products from "Solar Centre" wouldn't buy from anywhere else, after sales service is excellent..
"Commissioned" this garden lamp last week. It was a birthday gift in January. Blown away by the result. It looks wonderful, but lonely, and I shall be buying some companions for it. It's warm light is gorgeous. Iâ€™m very pleased with the solar flame torches I bought. In fact I sent for a further two. They look great around my patio. Recommended by brother, and have bought three. Fantastic lights, bright and look really good. Get some!!! Very very pleased with our Torches & fast delivery as well, will certainly purchase more of this wonderful product, love the USB charging, brilliant idea & well done to Solar Centre. OMG how fab are these lights! I have had so many comments about them. However time will tell if they continue to be amazing with all that the elements throw at them. Pity they are on the pricey side,otherwise I would have had some more. A lovely warm light. Wow what a pair of lights.... I love the effect and fantastic value for money. I could sit and watch these all night â€¦. just a pity the nights are so short in Scotland at the moment... looking forward to see how they preform in a Scottish winter. Brilliant so far Been in service for a week in very grey winter. Good so far but performance may be subject to review later. These lights are great. They really do flicker like a flame. I have them close to my pond and it is quite surprising how much the illuminate the area. Was going to buy a couple more but I'll have to wait till they go on offer again. I purchased two of these lights, and although I have only tried them to make sure they work I love them. I will put them in my garden when the weather improves. They arrived promptly and were well packaged. Bought as a gift so haven't seen them in situ yet, but I did try it out before giving it, and was very impressed with the effect. I charged it up on quite a cloudy day, but the charge was still enough to power the light. It really does look like a real flame! Also plastic casing feels very robust. Would definitely recommend. Bought two of them before Christmas fantastic!. One started to play up so phoned in to see what could be done. Send it back and we'll take a look. This I did and received an email a couple of days later to say a new one was in the post. Arrived safe and sound now working well. Now in receipt of our third one. Probably a few more to come in the future.Thank you for terrific service. brilliant I love these lights. good service and good packaging. I look forward to the summer evenings.Must find the money for more. Having searched and seen the true flame product, I was at first taken in by the look only to be amazed by the actual product, even during the dullest of winter days these lights charge and give a wonderful warming candle effect, will purchasing more to enhance my garden, great product price and company. I think I was a little disappointed with the obvious plastic exterior. However it is solid. Then when they came on, I was truly amazed. Stand next to them or viewed from afar, they are fantastic. Coat the outside with something metallic looking and these will be perfection. Good quality, very realistic. Good delivery. Ordered 2 and took them out to our apartment that I rent out in Spain. They are on a beautiful terrace and they look amazing and very realistic. I'm sure our guests will love them. Will be ordering 4 more for our own garden back in the uk for the summer. Highly recommended. Ordered two , they are great and give more light then you would expect . Have 6 of these around our fish pond, and look really good have some lovely compliments from neighbours and friends, very pleased with them and the service we got. They are amazing, looking like real flame, hopefully no one calls the fire brigade! I can't wait for warmer weather to entertain and show them off. Can always rely on solar centre to get quality goods. Other solar lights are never as strong or durable. 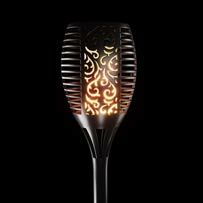 These solar-powered torches are truly magnificent - a real cut above any other we have seen available for sale. The flickering orange light looks exactly like real flames, and lighting up a driveway, as we've put them, looks truly spectacular. They work perfectly, are easy to operate and install, and arrived on time. I cannot recommend these lights highly enough. If you want impressive, perhaps slightly unusual and quirky, lights to make a real statement, these are the ones to go for. I was a bit apprehensive at first because my light was not pre-charged and didn't work. However, I left it to charge for 3 days then tried again. This did the trick and it works perfectly. I was so impressed by the realistic looking flames and I can't stop looking outside and watching my lovely light. I love it so much that I ordered another one! The new one arrived today and started working as soon as I turned it on, its fantastic!! I'm thinking of buying a couple more for Christmas presents!! The video looked good, the real thing is even better! By far the most realistic and effective solar garden light I've had to date. Time will tell, but initial reaction is superb! Yes, a bit pricey, but outsanding! I was very pleased with the quality of this product and the effect of the TrueFlame flickering torch in my garden from my first purchase of this item, that I just had to add some more to the garden to give a much greater effect. I am over the moon with this product. Fantastic Product. Very realistic. Don't expect too much heat though !! The Winter setting option is great. You hardly notice the dimmer light output but it lasts much longer with limited daylight. Does what it says on the tin and highly recommended. Very refreshing to get a solar light which has a warm light rather than white cold light. Very happy with it. These lights are sensational -really beautiful. I had to do the 3 day wait before switching on but they are now burning brightly. I bought 3 and only one is south facing. Well worth the money considering the impact they make. I bought six of these lights and they are absolutely brilliant. They are a warm flickering light and do look very real. The lights are well worth the money and I will certainly purchase more in the future. I have bought many lights from this company before and have not been disappointed. I ordered these because of the excellent reviews for this product. I left them turned off for a couple of days so they were fully charged, then when it got dark I pressed the button for 3 seconds and they started with no trouble. They look amazingly real, and give out a flickering orange glow around the garden. I am planning to buy a few more next month. Brought 4 of these and they look amazing very realistic flame effect , Fabulous !! I've got 6 of these scattered around the garden and they look amazing! They seem really good quality; I've had 3 of them for a couple of months and they always come on at dusk each day and are still going when I go to bed. I can't believe how realistic the light is, they do look like a real flame. Love this torch light so much that I am going to order another one! My grandchildren are completely mesmerized by the flickering flame which never fails to come on as soon as it gets dusk. I have also bought fairy lights from this company which look stunning placed around my garden arch! Highly recommended! Love these lights. I've got 2 for myself and just got a third one for my sister, she will love it!!! So different and works so well! Just looks like flames!! Delivery brilliant too! Very good idea and product.with excellent charging ability, albeit we live in sunny Algarve. I would like o put them either side of the front door, but cannot think of a way to erector them Any thoughts off a bracket. Also as they would be in a public area they will get stolen so I have think of a way to avoid theft. Anyway, a great product. I have bought 12 for Christmas presents. I think this time you have racked the potential rust problem of the so called stainless steel items you had. ! Lovely lights, realistic flame effect and well constructed. Worth the cost. These are just great. They even burn at Christmas, especially if you can do north facing. I have 2 out the front [south facing] and 3 at the back [which is north facing.] The back ones just shine for about an hour but as its mid December, I think that's pretty good. Other solar lights in neighbours' gardens have long since given up completely. The ones out the front vary depending on weather but I usually get between 3 and 6 hours per night. So many people comment on them because they do look like flaming torches. I think they're superb. Just no words to describe these lights they are fantastic, so different from anything that I have seen. I brought 2 that arrived yesterday and will be buying another set at the end of the month. Absolutely love these. They are stunning and so realistic. I bought two and they have been really admired most people think they are real flames. Light is very effective. Decorative rather than strong illumination but it is a decorative light. First one was poorly packaged and broken on arrival. However, Suzie Fraser very quickly arranged a no quibble replacement which arrived next day. Excellent customer service and a nice light too. Delighted with our purchase bought 2 and they look amazing and flame so realistic. Delivered within 2 days. The TruFlame provides an interesting feature in the garden .i brought two and will consider getting more as it is a big garden .It will be excellent for a display over Christmas . Had to leave for 3 days, but well worth the wait! Look fantastic, even brought the neighbours out. Should have purchased more. The fairy lights l purchased from you ages ago are going strong, just need to recharge the battery occasionally. Delivery good Packaging good Looks fantastic in the middle of the rockerie when viewed from the lounge during the evening and night, contemplating buying a second one, great product, soft flickering flame, not a static light, very pleased with the product and the price. Absolutely amazing and incredibly realistic. Just like having real flame torches in the garden. Been in the garden for over a week and many days have been cloudy but the torches still come on for a good few hours every evening. Will definitely be buying more and also as Christmas presents. These really do look rather amazing. Can't work out how they work but they are so realistic. Usual high quality that I have grown to expect from the SolarCentre and customer service second to none. Bought one and had to get another! Absolutely fabulous lights, you won't believe the realistic effect considering it's a solar light. They have the same mesmerizing effect as real flame. They look truly spectacular against our cedar panels. The part of the garden they are in is not the sunniest and even on a cloudy, dull day they come on every night for a good couple of hours. I put the torch part in the sunshine for a few hours one day and that night they lasted almost through the night. Very good quality and sturdy. We are so pleased with them we will be buying two more. I bought these as a surprise for my husband who had seen similar in town. Not only do we both love them but our teenage daughter thinks they're brilliant! Now that's success!! Very pleased with the solar torch light and the service from Solar centre. 10 out of 10. Brilliant product and even better company. No problems whatsoever apart from the box it was sent in....it was delivered quite bashed in to be honest but the item itself was fine and works brilliantly and thinking of buying a couple more. Do not hesitate in buying this item it's fab!!! Exactly as the video shows. Bought as a present so not in us yet.but looks very well made and good quality product. Received very promptly. These solar lights are very impressive with the flame effect, make a focal point in the garden, especially when sitting out on the nice evenings we have had recently. I am sure the wife will be instructing me to buy more! I am really pleased with this Solar Light. It looks beautiful in the garden. If it wasnâ€™t for the price I would have bought a second one. I think it is a bit expensive as it is plastic. These solar lights are beautiful we placed them around the garden and I now looks like a little oasis, it is truly stunning when they light up. They arrived well packaged and very promptly. The one delivered was faulty loose inner. Rang solar centre and a new one was in the post arrived following day. Lovely addition to the garden. Cannot fault the solar centre. Well recommended. Bought 2 of these for my garden ,love them that much I'm going to buy more. They look fabulous . Really pleased with the quality of the product even though they are plastic . Ideal xmas presents too. Real please with the company, as I have purchased other solar products from them before.. I wouldn't buy from anywhere else . These candle lights are absolutely beautiful, in fact the best solar lights I have ever had. I thought they were a bit expensive as I bought 5, but worth every penny They are truly like a flickering candle and the light from them is fantastic. I also bought the fence lights and they are fantastic too. Would highly recommend this company to anyone as all the lights are fantastic. I purchased 2 of these solar flames for a family members birthday. It is only recently that I have seen them. They make such a garden statement, the actual solar lights are stunning at night & give the illusion of a flame burning. A most attractive present, & I can definitely recommend them. This solar light is so realistic I love it and want to order a few more ..... very interested to know how it performs in winter !! Have four of these lights in our rear garden. They look absolutely amazing - by far the most advanced solar lights we have ever purchased. The clever flame effect is bright, fast and extremely realistic. Both of our neighbours also (independently) bought sets of their own and we all love the 'resort feel' they lend to our gardens. Would highly recommend them. Fantastic solar light. Realistic flames, last nearly all night. Totally love this torch. These are great nothing but compliments since I bought them via Amazon though so disappointed to have missed out on the sale price directly. Makes you feel like you are on holiday out visitors have commented. Because all the Solar products I have purchased previously from Solar, I decided to take a chance and bought two TrueFlame Solar Torch Lights with flickering flame. Now I wish I had purchased as many as I could! They are absolutely realistic with brilliant flickering flames. I intend to take a photo of my grandson holding them. Fantastic purchase. I have got now 10 of these lights in my garden. That says it all. Just fabulous!!! Love these, bought 2 and they really do look like flames. Nicely made and good height. Nice warm colour light , very effective. Just ordered a second one because I was so pleased with the first. We use it with the caravan when we're sitting outside with friends in the evening. Lovely flickering away on a warm night with a cold gin and good company. Our friends have just ordered some too! Bought 2 of these after buying the multi coloured USB fairy lights that I was well impressed with. The torches are amazing, and look like real flames. One torch worked straight out of the box, while the other took a week outdoors before it came on. Going to buy more of these for the garden. Very pleased with product.Oriiginally intended to buy the mini version but incorrectly completed order. Customer service offered to change but so pleased with product we kept and ordered another.As these were bought in Feb it was great to be able to fully charge by USB. Great company to deal with based on our experience to date. A beautiful product which lights up my patio by night. also the speed in which it was delivered to me was phenomenal!! An excellent transaction, product well made, works well (despite dark ,cloudy skies since purchase) delivery was quick and office staff I spoke to were most helpful. I have only bought one of these TrueFlame Solar lights but it is fabulous. It looks very dramatic flickering away in the dark. I will purchase more when I can as I would like them dotted around the garden. I hope it will last for many years and if so it will be well worth the price. Had one as a gift, I was so impressed I immediately bought another. Then another two! They are truly impressive . However the first one seems to go off quite a while before the other three which is a shame. But a brilliant product all the same. These solar lights look absolutely brilliant when lit up at night. The flame looks very realistic and is a showpiece in the garden. You would not realise it is made of plastic as it looks like black metal. I've only just bought these so it will be interesting to note the longevity of them especially during the winter months. The lights are amszing I followed instructions and they work brilliantly. Would highly recommend. I absolutely love this. In the evening it looks fantastic and really lights up the area it's in. I'm planning on ordering more! Fantastic lights give off a great bright flickering light too, that's why I re-ordered 4 more of these lights, delivery although I paid for 3 day they arrived on the next day excellent. Solar lights have never let me down. I am so pleased with the solar torch light I have three in my garden they look fantastic, I have bought a couple for my sister I hope she will love them also. Delivery and service excellent as usual from the solar centre. So pleased with purchase I bought 4. Look great. Bought two of these lights and left them to charge for three days. When we switched them on, they both looked amazing. However, the second night one of the lights failed to switch on and I manually had to press the button for three seconds to activate the light. First I thought it was just a glitch, but unfortunately the same happened the following night. After following the advise of the Solar Centre, we persevered with this light for another week, but for some unknown reason this particular solar light will not activate itself when dark. It only works when you manually switch it on. The Solar Centre has kindly posted me another one and this one works fine. Excellent Customer Service as always! We haven't yet used these lights as we are undergoing a garden renovation but the quality looks superb. We have previously ordered six wall lights from this company and are absolutely delighted with them so do no reason why these shouldn't be the same. The company excel at customer service and I have recommended them wholeheartedly to family and friends, Thank you. Really looks good when the evening draws in. Realistic flame effect with an extremely good design. Bought two but could end up with a couple more. Its a nice change from the normal static solar lights. Great flame effect, obviously top-quality solar technology, judging by its brightness, and length of operation even after quite poor sunlight exposure, i.e. England in March. There are dozens of solar light products available, many of them cheaper than this, but it obviously pays to spend just a little more to get something that really works in our weather conditions. I bought these at Christmas and only got them out of the box yesterday. The on off switch gives you no indication of whether you are on or off which is disconcerting but I have to say after I had fiddled around with them after dark they were absolutely amazing!!! These lights are outstanding, they really do give a true flame effect and are also very bright on full power and stayed on most of the night. So impressed that I am going to order another 4 sets for the rest of my garden when they come back on special offer. They actually came on that night even though it had rained all day & was dull and miserable. Excellent service as always and the knowledge of a company that's cares for their customers as I have purchased many other solar lights in the past 4 years that have never failed me. Saw these first in my brother's garden and he was raving about them. Although we didn't see them in the dark and lit, he convinced us how good they were. So pleased we purchased them, they are really stunning and unusual. We ordered just one to start with and on receipt and seeing how sturdy and robust they are, we ordered a second one which didn't disappoint. We now have a neighbour who will be ordering very soon. Very quick delivery and free !! win win situation. Thank you. Extremely pleased with these lamps. Quick service. Solar lamps are fantastic, love them! Look realistic and add quality to the garden. Would definitely recommend. I was given one of these a birthday gift. I was amazed at the quality that I went straight to the website and bought another. So realistic and long lasting at this time of year. Knocks spots off any other solar light I have seen. Really pleased with my purchase. The lights are so realistic and are streets ahead of any other light. Very impressed,my previous garden solar lights mostly turn on too early and turn off too late,thereby wasting battery charge,Trueflame doesnâ€™t do that,it switches correctly to light levels.Definately recommend as a decorative item rather than light source. The lights look great. The first comment was from my neighbour - "I love your new lights, where did you get them?" Very pleased, thank you. This torch has a flame effect you would not believe. I forgot I had them the other night, scared the life out of me when I opened the conservatory door, love the high/low setting I bought four they look amazing around the garden. Check one out and see for yourself. I bought two of these last year and decided I had to have another - they are truly wonderful and the flickering effect is so realistic- everyone who sees them comment on how great they look. Absolutely wonderful, bought 2 and liked so much bought another 2. Lovely warm glow, looks superb. 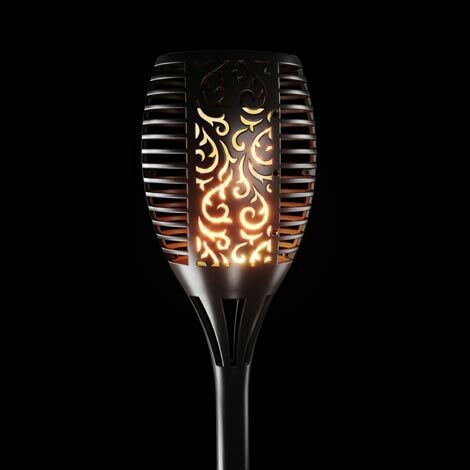 Having previously ordered 3 of these torches and found them to be so pretty and they look great with the flickering flame effect I have ordered another couple to complete my garden. This torch has a flame effect you would not believe. Twice i have done a double take thinking i have left it burning only to remember its a light. Check one out and see for yourself. Excellent delivery service. Very good and realistic flame effect plus quite bright.